The new Hustler Turf MDF LevelLift utility vehicle features a patented bed technology. The new Hustler Turf MDV utility vehicle. 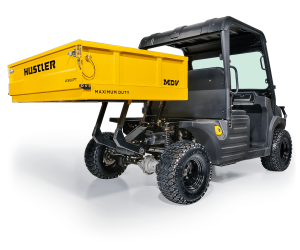 Hustler Turf, a manufacturer of zero-turn mowers, is entering the utility vehicle market with two models, including one with their patented LevelLift bed technology. LevelLift allows the bed to be lowered to the ground or raised back up for easier loading/unloading of material. The bed can lift up to 750 lbs and can dump material from any point in its arc of motion. The most significant difference between the two models is that the MDV has a 1,200 lb. cargo box capacity and the MDV LevelLift has the bed technology with a 750 lb. cargo box capacity. The manufacturer’s website does not list any MSRPs for the models but I found vehicle pricing on an Internet listing the MDV MSRP at $15,999 and the MDV LevelLift MSRP at $20,999. Hustler Turf adds to the list of power and farm equipment manufacturers that have been updating or starting utility vehicle lines over the last several years. 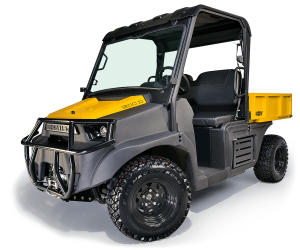 While some like Cub Cadet are offering value priced vehicles with a nice package of features and others are offering utility vehicles to fill out their stable of products, Hustler Turf is providing a vehicle with a unique technology. The significant price premium for the technology in the MDV LevelLift model suggest that it will probably have a relatively limited market appeal. However, it may prove highly useful for specific applications. 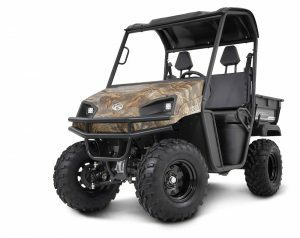 This is in line with recent trends in the commercial UTV market, where manufacturers are offering pre-configured vehicles or special option packages designed for specific end-use applications. 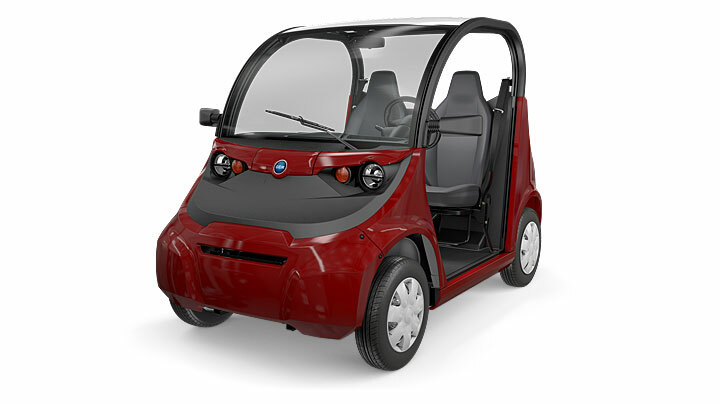 Polaris Industries recently announced a recall of certain model year 2016 and 2017 GEM electric vehicles because lug nuts on the front wheels can loosen and the front wheels potentially detach. The recall pertains to certain GEM E2, E4, E6 and ELXD models with steel wheels. As many as 1,254 vehicles may be affected. GEM will notify owners and is currently finalizing a remedy. Given their recall troubles in the side-by-side market, this is unwelcome news for Polaris. While the number of vehicles affected pales in comparison to the massive RZR and Ranger recalls, it is a sizable chunk of their total annual sales of GEMs. Only a few thousand GEMs are sold annually. The 2016 model year GEMs represented a major relaunching of the line. Earlier this year there was another recall for these vehicles related to the drive mode switch. If a wheel separates from the vehicle, it can increase the risk of a crash. Polaris Industries, Inc. (Polaris) is recalling certain 2016-2017 GEM E2, E4, E6, and ELXD electric vehicles, equipped with steel wheels. The lug nuts on the front wheels may loosen, potentially resulting in a front wheel detaching from the vehicle. GEM will notify owners. The manufacturer has not yet finalized a remedy plan, nor provided a notification schedule. Owners may contact GEM Consumer Service Department at 1-855-743-3436. Polaris’ number for this recall is L-17-01.